I am a child of the late '60s and a teenager of the late '70s. Unearthly sounds have fascinated me since I was knee-high. Be it the dramatic swoops and swirls of Delia Derbyshire's original realisation of the 'Doctor Who' theme or the dehumanised beats of Kraftwerk's 'Man Machine', I have a soft spot for synthesised or electronic music, call it what you will. As well as Delia and our German friends, there are a number of landmark albums that in my opinion should belong in any enthusiast's collection. One of those has just been re-released in a deluxe 2-CD edition and it is a delight to hear it again. Like welcoming back an old friend. And we are talking analogue synthesisers and sequencers here which in recent years have made something of a trendy come back in the search for that truly retro feel. 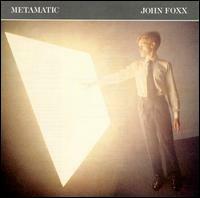 I'm talking about 'Metamatic' from ex-Ultravox front man, John Foxx. It was his first solo album after splitting with Ultravox (a run of three rather good albums from the glam-punk of 'Ultravox! ', through the rock new wave of 'Ha!Ha!Ha!' to the benchmark fusion of new wave and machine music of 'Systems Of Romance' before Midge Ure turned up and they went mainstream) and it arrived in 1980, all futuristic and shiny and picking up on a vast range of influences that would eventually set out the stall for the more European influenced synth-pop acts of the mid-'80s. What strikes you about 'Metamatic' is Foxx's obvious obsessions with art and literature - namely the juxtaposing and placing of figures in threatening land and city scapes by the surrealists Magritte and de Chirico, the playfulness of Dadaism and Duchamp, as well as the books of J.G. Ballard whose themes about grey alienation within rapidly changing cities are echoed here by the many songs about and references to plazas, buildings, concrete, roads and motorways. The album is cousin to the mid-career work of Kraftwerk and early Human League, and Numan's 'The Pleasure Principle' borrows sounds and ideas from this and 'Systems Of Romance' wholesale. Unlike those other early electronic musicians, Foxx's compositions are harder-edged, without an overt commercial 'warmth' and are defined by their rudimentariness and adherence to a utilitarian aesthetic. And they still sound unearthly, anxious, distancing, cynical and distinctly English. There are also hints of his later flirtation with English pastoral, the Beatles and psychedelia in 'Touch And Go'. With these connections, this early work comfortably sits alongside the art-pop/rock of Brian Eno, Peter Gabriel and the rest of the post-punk scene and could also be seen as influenced by the Eno/Bowie collaborations of 'Low' and 'Heroes'. It certainly has a different feel to it than his follow up albums 'The Garden' and 'The Golden Section' and Foxx has in recent years emerged from obscurity to re-engage with these ideas on albums such as 'Crash And Burn' and 'The Pleasures Of Electricity'. There is a silvery sheen and crystalline brittleness to all the compositions as they unfold with their tales of urban angst, cities populated by citizens suffering from identity-theft, the merging of man and technology through everything from cars to warfare. It is essentially an album about fallout - both physically and metaphorically in terms of living in the shadow of the nuclear age where most songs are aglow with a melancholic and often disturbing radioactive vision - and how this changes and mutates us. 'Blurred Girl', 'A New Kind Of Man', 'He's A Liquid' and '030' all echo a retro JFK post-nuclear society and continue a theme first explored in the early Ultravox song 'Hiroshima Mon Amour' and the experimental flashback techniques from the 1959 Resnais film of the same name. It is a seminal work and the 2-CD reissue features all of the single b'sides and associated extra tracks together with some previously unreleased material on Disc 2. The tracks 'Cinemascope' and 'To Be With You' and the alternate version of 'Like a Miracle' (this one later to be revised for 'The Golden Section' album), haven't been available before. The revival of interest in his work and his recent return to this genre, with a rather abundant output of new albums, has long been overdue.